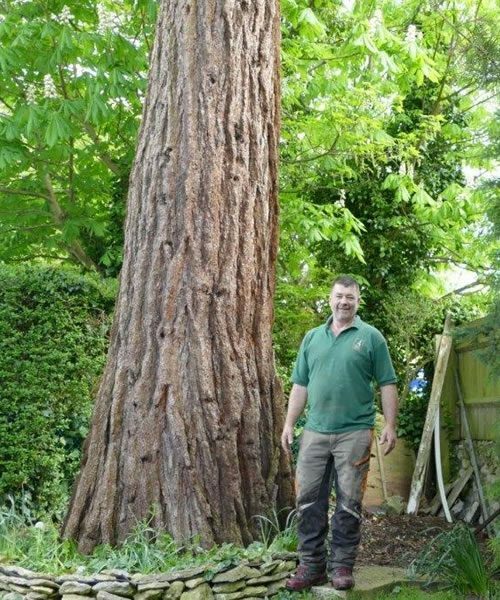 Four Seasons were asked to look at a large Redwood tree in Wheatley which was in an unsafe condition and needed to be felled. Trees are often struck by lightning in the Thames Valley area and Redwoods because of their great height are struck more often than most other species. This particular tree was growing in a garden in Wheatley at the top of a hill. It stood at around 26 meters in height and had a stem diameter of just over a meter at chest height. It was less than 100 years old but was already the tallest tree in the vicinity by some margin. The top third of the tree was completely dead and a spiral fissure ran from the top almost to the ground. This type of damage is typical of lightning damage on these big conifers. Dead branches had already fallen into the garden and it was obvious that the whole tree needed to come down. The tree was very large and the clear working space in the garden below was very limited. We assessed the job carefully and came up with a suitable method for felling the tree without risking any damage to the garden or property. The first step was to completely board over the garden below the tree to prevent any damage to the lawn. Secondly we moved our cherry picker in to position and set up a heavy duty rigging system. 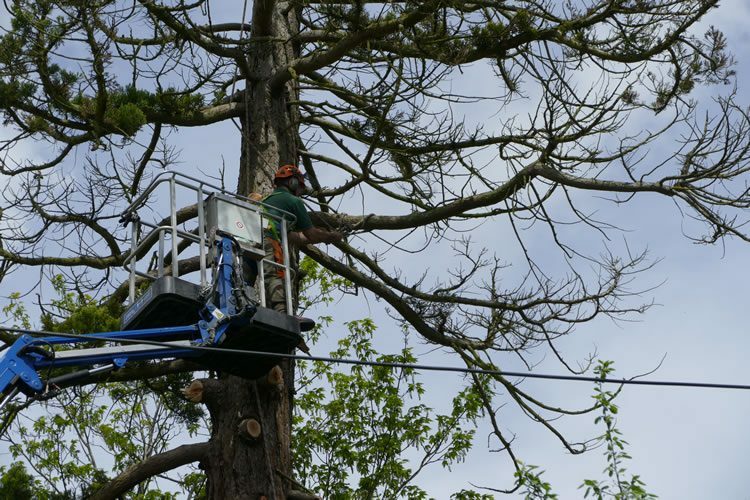 You can see in the video how large branches are cut and safely lowered to the ground in a very controlled manner. One of our climbers used a similar technique to dismantle the top of the tree which was well above the reach of the cherry picker. Once the main trunk was down to a height of around 5 meters there was space to fell it into the garden onto a well prepared crash pad. Everything was then efficiently cut, cleared and removed from the garden. When the boards were lifted at the end of the job the lawn was in perfect condition. Aside from one large stump you would never know any work had taken place and the property owner was extremely impressed.